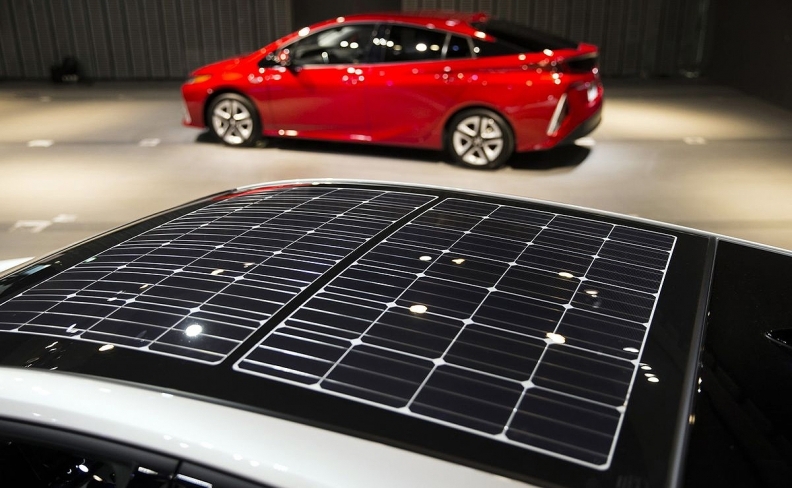 The solar rooftop represents a step forward for Toyota as it aims to reduce carbon dioxide emissions from new cars by 90 percent by 2050 from 2010 levels. TOKYO -- Panasonic Corp. sees the future of solar on car rooftops. The Japanese electronics giant has started producing a 180-watt array of solar cells that can be fixed to the roof of an automobile. In February, Panasonic announced that its photovoltaic module would be used on the roof of Toyota Motor Corp.’s latest Prius plug-in hybrid. Cars represent a potentially lucrative new outlet for solar cells in an industry where intense competition from Chinese manufacturers has pushed down prices sharply. That’s prompting some manufacturers to adapt solar cells for everything from home roofing tiles and the outer skins of buildings to backpacks and tents. Others are noticing the potential. Tesla Chairman Elon Musk tweeted in November that his company’s Model 3 car may come with a solar roof. He’s also beginning to sell a type of roof tile for homes featuring embedded photovoltaics. Nissan Motor Co. offers an add-on solar panel option for its Leaf electric cars, giving extra charge to systems such as the air conditioners and radios, according to Nicholas Maxfield, a spokesman for the company. Hanergy Holding Group Ltd. unveiled four concept solar cars last year but has yet to begin commercial production. It’s seeking to develop car roofs using thin-film solar chips with Fuyao Glass Industry Group. The latest Prius is the first mass-produced model to be outfitted with solar panels that provide juice for the car’s main battery, according to Toyota. Because of seasonal variations in sunlight, the amount of charge will fluctuate, meaning the average distance traveled on a single charge will range from an average of 2.9 kilometers (1.8 miles) to 6.1 kilometers depending on the time of year. “That means you get about 10 percent of annual mileage from solar just by letting your car sit,” Okamoto said in an interview in Tokyo. While that’s modest, developers say the amount of charge will improve over time and that the range could be extended by adjusting a car body’s design and the amount of surface upon which the panels can be affixed. To handle the variable sunlight expected from shade, Panasonic also adjusted the way bypass diodes are configured in the solar panels to ensure a smooth flow of electric current, according to Panasonic’s Okamoto.